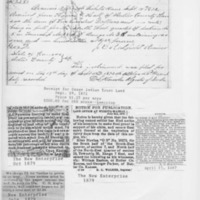 Butler County Register of Deeds, “Receipt for Osage Indian Trust Land,” Digital Rose Hill, accessed April 19, 2019, https://rosehill.digitalsckls.info/item/14. We charge $3. for ‘‘notice to prove up on Unit. Tbete notices must be ■ ur-IUtied in the paper neatest the and. So e-tvs the law. C. H. E.sgin. attorney, will make out papers tor 50 Jcuis, a total Cost of S3 50. LAND OFFICE AT WICHITA *AN8A8, ) . f Riley Blevins, “D SM Nq. 16273, for the South half of' the 'South-East quarter, of section 7, and North half of the North-East quarter of section 18, Township 29, Range 7 East, and names' the following as bis witnesses, viz: William Rasbon, of Butler Co. Kansas, and George*' Parker, of But-, ler Co. Kansas. The Southeast quarter of the Northwest quarter and the North half of the Southwest quarter and the Southeast- quarter of thrt southwest quarter Section Thirty-six, Township Twenty-eight, Kangc three hast, and that be has tfontlnuonfMy resided Iherror) fdT more than six months last, past ami mad® t-lio game fho only home for himself and familr. That lie is about to file his petition with the Probate Court of Butler County, Kansas, praying that ho may be allowed to purchase saM land as hv law' provided, which petition will be hcard before said Court on the •■•Vh day of April. 1887, atone o'clock, p- ra-» V' which time said petitioner will produce J. Barker, C C Wells. C. K Masking and John . "nilor, all of Pleasant township, Butler County, Kansas, as witnesses by whom ho exj to prove said settlement au<l Improvements.